We are a leading Manufacturer of 4 x 10/100 mbit/s fast ethernet port epon onu from New Delhi, India. EPON ONU is a equipment used in PON networking system to provide data service for end users.The main function of ONU is receiving the optical signals from downlink and convert it into ethernet signals then deliver to users. And receiving the ethernet signals from uplink signal of users equipment or networking and switch it into optical signals then deliver to upper networking through PON networking system. 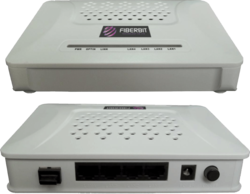 FB-E-ONU4FE EPON ONU is a device with 1 uplink GEPON port and 4 10/100M Fast Ethernet RJ45 ports, it suits for the FTTB & FTTx both networking system. Looking for Internet 3G USB Modem ?